· Ricki Podolor: electric guitar. · Gabriel Mekler: keyboards and arrangements. · Donovan's fans: backing vocals on Atlantis. · Contract disputes at the time caused different releases of the song Atlantis in the UK and the US. It was originally released in the UK as a single, backed with I Love My Shirt. It was released in the 1969 album Barabajagal in the US, but not in the UK, so Atlantis was next released in the US as the B side to the To Susan On The West Coast Waiting single. · The record company thought that Atlantis would not make a good A side in the US because of his length, the elaborated lyrics and the fact that one third of the song was a poem read by Donovan. 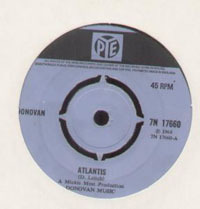 That was why, despite its success in Europe, Atlantis was used as the B side in the To Susan On The West Coast Waiting single. The record company was proved wrong (as usual) when Atlantis became a worldwide success, exceeding To Susan On The West Coast Waiting, most of all in countries like Austria, the US, Germany and Switzerland, where it became a number-one hit in 1969. The song itself became an anthem of the hippie movement. · The first third of the song is a poem recited by Donovan, about the civilization of Atlantis, and island in the middle of the Atlantic. The Atlantean colonists are depicted as the founders of the myths and beliefs of ancient times. Knowing that their island was about to disappear in the sea they sent out ships to preserve their masters' wisdom, and so they brought civilization and culture to primitive humans. All this exotic and mythological images had great success in the 60's hippies minds: the symbol of the counterculture movement, with the hope that true love will be found if ever Atlantis can be reached. · It's believed that Paul McCartney collaborated in the song with backing vocals. Some books about The Beatles' chronology claim that, while others prove the opposite saying that Atlantis was recorded in Los Angeles in November 1968, and McCartney spent most of that month in his farm in Scotland. · Atlantis was used in one of the most violent scenes of Martin Scorsese's 1990 film Goodfellas, where mobster Billy Batts, played by Frank Vincent, was brutally beaten by Joe Pesci's and Robert DeNiro's characters.